The install took about an hour and was punctuated by Eric’s usual brand of humor and relaxed attitude. At the same time, he was noticing things here and there which had nothing to do with the install, and darting away only to return with a bottle of something to correct something else he had noticed in the process. His attention to detail and the way he just does things without even asking really shows how much he cares about these cars, his customers, and the pride he takes in his work as well. I cannot recommend his work enough if you are lucky enough to live within range of the Helix garage in Philly. The install went by really quickly, but I had one question regarding the bar making noise. (In my research it seems that this is the most common concern with installing a mod such as this, and Eric was quick to give me the low-down.) The bar is greased during install and shouldn’t need another greasing for 24 months or so. Of course Eric offered to do it for free! So there – noise problem eradicated. Now it was time to head home, and fortunately the rain which plagued my ride down had been replaced with sunny skies – and dry roads. I made sure to hit lots of exit ramps so I could really see what the bar does, and man does it DO what it DOES! The car just feels like it’s woken up from a nap! The bar only comes into play on turns – driving under normal conditions you won’t feel a thing. The ride feels the same. The car isn’t lower or higher. It all feels the way it felt prior to install. When you really feel it is in a high (or spirited) speed turn of any arc. The understeer inherent in the MINI’s engineering is simply gone. The car feels eager to rotate into turns and your confidence is vastly increased as a result of this. You really have to feel it to understand it. My original concern that the car might feel loose or twitchy was immediately assuaged. The car now feels much more like the formula 4 race cars i’ve driven at Skip Barber Racing at Limerock Park. It really is that noticeable. Similar to those formula cars as well, is the amount of input required to initiate a turn. With the Rear Sway Bar installed, I immediately noticed that the wheel required far less driver input to change the direction of the car. For me this is a real thrill as the feel of a race car is once again inched closer to. The car’s steering has a vastly increased sensitivity now, and I’m not sure that’s been conveyed as such in all the research I did prior to installing one in my own car. It’s a blast and a feeling which really lends itself to the vibe of the MINI. Overall I couldn’t have asked for more. Yes, the JCW Suspension keeps the car nice and low and the spring rate is perfectly tuned to the car on which it’s installed. But adding a Rear Sway Bar is really the finishing touch. I would venture to say that given the choice to do it all again, I would have done the bar first – it’s just that much fun. The H-Sport 19mm was a breeze to install, has a proven record of reliability and seems pretty impervious to squeaking with it’s design. 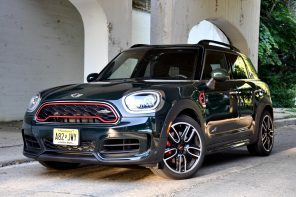 I highly recommend both the H-Sport and Helix on this one – it will literally change the way you drive your MINI…for the better.